"- You can bet on BIG or SMALL symbols, which the total score will be from 11 to 17 for BIG, and from 4 to 10 for SMALL. Both inclusive with the excerption of a triple. The payout for both BIG or SMALL is 1:1. - You can bet on one of the symbol, which must appear on at least 2 of the 3 dice. This is called a Double and the payout is 10:1. You can bet on one of the symbols, which must appear on all 3 dice. This is called Triple or All. The payout is 80:1. You can bet one all of the symbols, that the same symbol will appear on all 3 dice. This is called Any Triple or All ""Alls"". The payout is 30:1. - Three Dice Total is a specific total score in the range if 4 to 17 inlusive. You can bet on any total of the three dice. Thus, if any of the total of the dice hit, the bet will be pay off at each pay rate respectively, such as the payout for total 4 and 17 is 60:1, total of 5 and 16 is 30:1, total of 6 and 15 is 17:1, total of 7 and 14 is 12:1, total of 8 and 13 is 8:1, and total of 9 to 12 is 6:1. - Two Dice Combinations is when two of the dice show a specific combination of two different numbers (for example, a 2 and a 3). You can bet on any of the Two Dice Combinations and when the dice hit, the payout is 5:1. 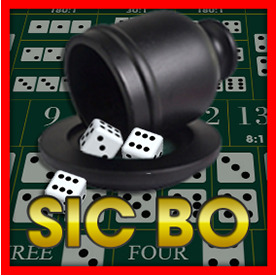 - Single Dice Bet is when the specific number of 1, 2, 3 4, 5 appear on one, two or all three dice in the game. If the number appear on one of the dice, the payout is 1:1, if the number appear on two of the three dice, the payout is 2:1, and if the number appear on all three dice, the payout is 3:1. + Select a stake by tapping on the chips at the bottom of the screen. + To place a bet, simply tap on any number or combination of numbers on the table. The chip you have selected will now appear on that position on the table. You can place as many different bét as you wish. + Tap the Start button to role the dice. Three dice will be rolled inside the pottery bowl. + If the dice do not match your predicted numbers, you lose your stake. If your numbers or combinations are correct, you win the payout associated with that bet. + Tap Rebet button to bet exactly the same bet as the previous game. + Tap Clear button to clear selected stakes, and redo your bet."